Phil Roche on What’s a Laser Disc??? Mary Bowen on What’s a Laser Disc??? Dr. Mabuse is dead! 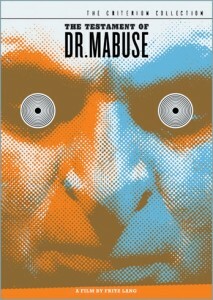 Long live Dr. Mabuse! This was the theme of Fritz Lang’s final entry of his ‘Mabuse trilogy’, as well as being his final film as a director. In the best Mabuse tradition, it has something for everyone: women driven to madness and suicide, people who are NOT what they seem, masters of disguise and ingenious methods of death and destruction. The film begins with such a death, that of investigative TV reporter Peter Barter, by a high-pressure needle gun to the brain (in a drive-by shooting that is almost a scene-for-scene copy of a similar execution in The Testament of Dr. Mabuse). Sharp-eyed viewers and students of world cinema will recognize Jess Franco’s favorite go-to villain Howard Vernon as the assassin ‘No. 12’. Barter’s murder is just the latest in a long line of puzzling homicides for Police Commissioner Kras (Gert Frobe, of GOLDFINGER fame). With no clues to go on, he reluctantly turns to celebrated blind psychic Peter Cornelius for help. The Commissioner and Kras have a history together, so much so that the psychic’s German Shepherd knows him by smell as an old acquaintance. As psychics go, Cornelius is an exercise in frustration. He can warn Kras of crimes that are going to happen, but never with specifics, such as who the victim or killer are. His next warning to the Commissioner concerns the Hotel Luxor in Berlin, which already has a reputation for more than average sordid happenings. At the hotel, a suicidal woman about to jump off a ledge. She is Marion Menil (Dawn Addams), long-suffering spouse to an abusive, club-footed husband. After her latest ordeal she decides to end it all, but is talked down and into the room of American millionaire industrialist Henry Travers (Peter van Eyck). He is entranced by her beauty and is determined to help her – she at first refuses, not wanting to draw him into her troubles, but eventually gives in out of hopelessness and exhaustion and with nowhere else to turn. Dr. Jordan (Wolfgang Preiss), her psychiatrist, is called after Marion’s suicide attempt, and confers with Travers about Marion’s past and her situation. Travers promises the doctor (and the police) he will take responsibility for her, and slowly the two begin to fall in love. More characters are introduced: the seedy insurance agent Hieronymus B. Mistelzweig (Werner Peters), who runs his business out of the hotel (when he’s not cadging free drinks) and has a finger in everyone’s business; the hotel director and house detective, who seem to know far TOO much about all of their guests, and others. The paths of Cornelius and Travers intersect, with the psychic telling the industrialist that a business deal he is waiting to hear about will not go through. As predicted, the Taran Nuclear Works plant deal falls through and Travers becomes more curious about Cornelius. Back at the hotel, we finally see the ‘Thousand Eyes’ of the title of the film. It turns out that during World War II, the Nazis had installed secret cameras and microphones in all the rooms, with a massive spy control center in a concrete bunker in the basement. All the better for blackmailing, intimidation and the learning of state secrets. However, they did not stop there – Travers is shown into the room next to Marion’s by the hotel manager, who promises him “something interesting”. That something turns out to be a one-way mirror built into her room so he can spy on everything going on there. While he is offended by the man’s salaciousness, he rents the room out so no one else can spy on her. Timing is all, as he observes Marion and her husband, who forces his way into the room and begins attacking her again. Trying to defend herself, she falls back and is about to be mortally hurt by the man when Travers breaks the mirror out and shoots the husband dead. Like it or not, he is now involved up to his neck. Marion tells him she can take care of the body and calls Dr. Jordan, who arrives in record time, agreeing to write a death certificate for a heart attack and has the body taken out discreetly via the freight elevator to his waiting ambulance. As it pulls away, the ‘dead’ husband pulls the sheet off, pleased with “Mabuse’s” plan to capture his ‘death’ on film for blackmailing Travers. Not as pleased as No. 12 and his needle gun, who tell him his usefulness is up and shoots him. They dump the body and disappear. Kras, Travers, Marion and Mistelzweig are all invited to a seance’ given by Cornelius. Before it can get underway, however, Cornelius asks to change seats with the Commissioner. As he does, Kras settles in only to be told by Cornelius to get down – an assassin’s bullet strikes the seat where Kras’ head had been moments before! Kras and his assistant try to capture the gunman without success, and the seance is called off. Mistelzweig stays behind, trying to interest Cornelius in becoming his business partner in the insurance racket, but is turned down. He tricks Cornelius into giving away the fact he’s not REALLY blind, but has been wearing white contacts the entire time – he’s willing to keep the secret, saying it’s a nice touch, and advises him to re-think joining him. The film ramps up to it’s whirlwind conclusion back at the hotel when Travers figures out Marion isn’t what she claims to be and was in on the blackmail attempt – she swears to tell him all, but only when they’re outside. Her panic starts to get to him as well, and they take an elevator to the lobby. Instead of the lobby door opening, however, a SIDE door opens, revealing the spy center. The manager and hotel detective both work for “Mabuse”, and when questioned by Travers who he is, they tell him he’ll meet the good Doctor soon enough … and then he and the girl will die. Travers tries to shoot it out and escape, but Marion is wounded in the process and they are both locked in the camera center. Out in the lobby, Mistelzweig sees the elevator come down but the door never open. He also sees Dr. Jordan ENTER the same elevator, without it ascending. He nods, putting it all together. In the control center, Dr. Jordan reveals Marion was under his hypnosis, working to make Travers love her. She would marry Travers and he would have been killed, with Marion inheriting all his assets, including the Atomic Plant where Jordan would have made and deployed nuclear missiles. “You are insane”, says Travers. “Maybe … that’s what they said about Dr. Mabuse … who died 25 years ago and whose name and plans I used.” Leaving Travers and Marion to die in the soundproof room, Dr. Jordan takes off his goatee and hairpiece to walk past Kras and the police in the lobby. Mistelzweig (who, it turns out, is secretly an Interpol agent) has a surprise of his own for Jordan … the German Shepherd! Turns out Dr. Jordan was ALSO the fake psychic Cornelius and is given away by the dog. Thanks to No. 12 and his machine gun, Jordan/Mabuse gets away in a sedan for the final car chase, with Kras and four motorcycle cops in pursuit. Mistelzweig goes into the control center and cleans up the henchmen there, freeing Travers and Marion. Jordan/Mabuse are cut off on a bridge by the police and plunge to their death over the edge. The final shot is a kiss between Travers and Marion (in a hospital bed), whereupon her head lolls gently over. A quick pan to their clasped hands makes you wonder – is she unconscious? Dead? That is for you to decide. All Day Entertainment did a marvelous job restoring the film on DVD, and includes both the original German and (horrible) English dubbed soundtrack. The extras include another informative audio commentary with David Kalat, poster and ad art from the Mabuse films, trailers from other entries in the series (most of them hopelessly inept and renamed) and a 35-minute documentary featurette called “The Eyes of Fritz Lang”. As I mentioned earlier, this would be director Fritz Lang’s last shot at a Mabuse film, and his last directorial effort period. The title makes this even more ir0nic, when you consider Lang had to give up directing due to his failing eyesight (and advanced age). The film was very well received at the time of it’s release, leading to a mini-Mabuse marathon, with a series of lesser films over the next few years by different directors. The Mabuse Cycle, with their dreams of world conquest and advanced weaponry, were the prototype for the James Bond series that would begin two years later with 1962’s DR. NO. Not a bad legacy, after all. When you see the newest chiseled actor playing 007, you can admire his stunts and coolness in the theater … but when you see the latest megalomaniac he’s up against, remember to give a small salute in the dark to the latest child of Dr. Mabuse. In 1933, Fritz Lang continued the adventures of one of his earliest successes, that of the demagogic madman and criminal mastermind Dr. Mabuse. Confined to an asylum at the end of 1922’s Dr. Mabuse, der Spieler (Dr. Mabuse, the Gambler), the good (bad) doctor (again portrayed by Rudolph Klein-Rogge) has been locked away for the last ten years, staring into space and doing nothing but writing … and writing … and writing. At first the writing is nothing but doodles and scribbles, nonsense words that fill up pad after pad. Over time, however, the writing starts to make sense, a word here, a sentence there, until it all comes together (complete with complex drawings) for Mabuse’s Manifesto on how to run a Criminal Empire. 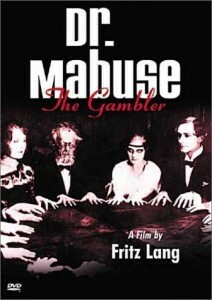 In the original 1922 film, Mabuse used “telepathic hypnosis” to bend people to his will and control his victims. Lang suggests that the doctor’s power has grown exponentially (since he has been locked away for over a decade, both physically in the asylum and psychically piecing back together his shattered mind, making it stronger and more dangerous) and that he is getting the cogs running again for his second stab at world conquest. The question becomes how is he doing this while locked away in solitary confinement? We are shown a gang of men, all with different code names and departments, getting the typewritten summons from “Dr. Mabuse” to meet at a certain time and place for criminal instructions. Upon their arrival at a warehouse, they are ushered into a curtained room, whereupon they are given orders by an anonymous shape behind the curtain. One such hireling is Thomas Kent (Gustav Diessl), an executive who has made bad decisions before in his life and served his time in jail, a man who has the love of the beautiful Lilli (Wera Liessem) and wishes to go straight, but who is caught up in the strangling web of Mabuse. Tom tries to break off the love affair with Lilli, telling her of his prison time for murder and his past. She assures him it doesn’t change her feelings for him, which gives him the courage to confront Mabuse and refuse to do any more of his dirty work. Announcing his intentions to quit the group, Tom and Lilli are told they have walked into a death trap and have only three hours to live! Tom shoots the character behind the curtain, only to find a wooden cutout of a man and a loudspeaker … and an ominous ticking noise. The police have been trying to track down the mastermind of the rash of crimes going on. Celebrated police Commissioner Lohmann (Otto Wernicke, reprising his role from Lang’s earlier hit M) is investigating the case of informant Hofmeister (Karl Meixner), whose mind has snapped after a run-in with Mabuse’s men (he is also now a patient at the asylum) – before they got him, he had time to scratch Mabuse’s name in a windowpane. Lohmann remembers the name and rehashes the events from the first film. Thinking he has the case wrapped up and the culprit caught, Lohmann calls the asylum – only to hear that Mabuse has died that very morning. Lohmann goes to the asylum to confirm this and is met by the director (and the man who had worked on Mabuse’s case the entire time he was interred) Dr. Baum (Oscar Beregi, Sr.) – much has been made of the following scene, where Lohmann (in the morgue with Baum and the corpse of Mabuse) dismisses the dead man as another harmless crank and Baum, rather than agreeing with the Commissioner, goes off on him extolling Mabuse’s genius and what he was trying to accomplish with his Manifesto. The reason why is because Baum’s words here (and some of Mabuse’s notes later on in the film) are taken from Adolph Hitler’s political screeds – this was Lang’s way of trying to warn the German people of the very real madman already in their midst. Unfortunately, it was a warning that was to fall on deaf ears. Back at the curtained room, Tom and Lilli have tried to find the ticking bomb, only to be driven to frenzy as they find walls and doors are all lead-shielded and there is no way out. In desperation, Tom cuts a water main pipe to flood the room and dampen the blast of the explosion. It now becomes a test of which way they will die, by explosion or drowning. As they are gasping for air, the bomb (which was set in the floor) goes off, blasting a hole in the floor and releasing the water … and providing their exit. They instantly go to Inpsector Lohmann with their case and with Tom’s typewritten instructions from Mabuse. Lohmann informs them of Mabuse’s death, yet the crime reign still continues … but how? As Doctor Baum had worked so closely with Mabuse during his stay at the asylum, collecting and reading his voluminous notes, Mabuse slowly took over Baum’s mind, until at the moment of his death, he performed his greatest feat: that of soul transference (seen on the screen via double exposure of Mabuse’s astral self leaving his body and entering Baum’s). Lang said that he regretted this portion of the film and that if he were shooting it again, would have left it out (leaving the plot more ambiguous). Tom and Lohmann go to Baum’s house and hear a recording from his study, saying, “I do not wish to be disturbed”. Tom recognizes the recorded voice as that of “Mabuse” at the warehouse, and looking at Baum/Mabuse’s notes on his desk for the next act of terrorism, sees it is for a chemical plant explosion that night. They arrive too late to stop the explosion, but Lang does manage to film an eerily-lit nighttime car chase of the fleeing Baum back to the asylum. Lohmann and Tom follow Baum/Mabuse to Hofmeister’s cell (which was Mabuse’s old cell), where they hear a violent, life and death struggle break out between the two men. Looking inside, Hofmeister is being led out and Baum is sitting on the cell bed, slowly tearing the Mabuse Manifesto into small strips, a page at a time. Mabuse’s tenuous hold on Baum’s soul has been broken, but at the cost of the man’s sanity. The tales of the making of this film are nothing short of astonishing, including Lang demanding as much authenticity as possible of his cast by shooting real bullets during certain scenes! There is inventive use of sound throughout, but at the same time, there are long stretches of silence. This may seem disconcerting to modern viewers who are used to music playing in every scene, but keep in mind the first synchronized score for a film would not appear until Max Steiner’s composition for KING KONG (released this same year). Silent films had musical accompaniment, of course, to set a general mood, but it was not scene-specific for an entire feature. The DVD of TESTAMENT is another Criterion Collection gem, a two-disc set featuring both this edition of the film and the French edition (which Lang shot simultaneously with different actors); audio commentary by David Kalat and many featurettes about all aspects of the character and the film, as well as a look at the advertising campaign and posters. 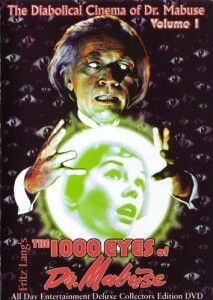 The Mabuse-thon concludes next time with Lang’s final film in the trilogy (and his final film as a director), 1960’s THE 1,000 EYES OF DR. MABUSE. I hope you will use at least two of YOUR eyes to join me then. Criminal mastermind, master of disguise, hypnotist, psychoanalyst, destroyer of men and seducer of women – all these and more describe evil genius Dr. Mabuse. Created by author Norbert Jacques, Mabuse is the literary great-grandfather of other Machiavellian villains, from Fantomas to Ernst Stavro Blofeld and beyond. 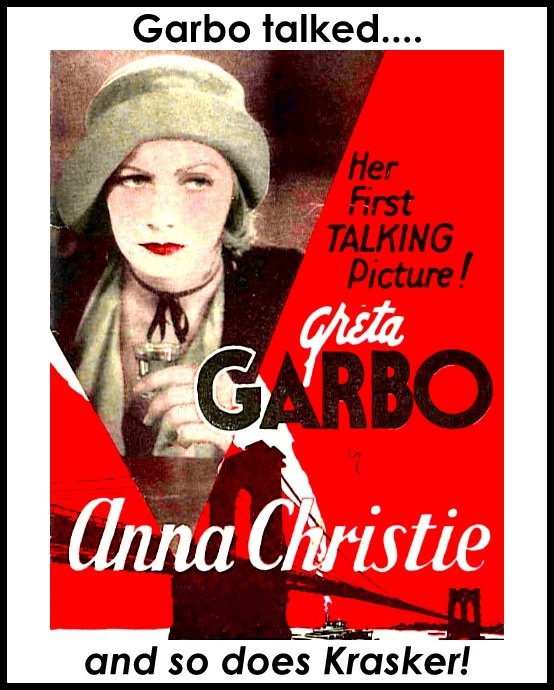 The pulp thriller was an immediate hit upon publication and was turned into a four hour extravaganza by noted director Fritz Lang, adapted for the screen by his wife Thea von Harbou. In the film, Mabuse (Rudolph Klein-Rogge) controls his underworld empire through intimidation and terror. He knows all the illegal gambling houses and delights in going in disguise to find the foolish and the weak-willed, playing cards against them (while hypnotizing them across the table), feeding on their desperation as they lose more and more, then either making them his slaves or sending them off to destroy themselves if they are of no further use to him. He also controls a counterfeiting shop, with the use of blind workers to count and stack the bills (a motif that would be carried over in the Edgar Wallace thriller and film Dark Eyes of London). Mabuse, in turn, is being pursued by State Attorney von Wenk (Bernhard Goetzke). For the majority of the feature, he does not know the identity of the master criminal, referring to him as “The Great Unknown”. Von Wenk captures one of Mabuse’s gang, his femme fatale Cara Carozza (Aud Egede Nissen) and tries to get her to talk. Instead she remains in jail, knowing the Doctor will come for her. And he does, but not as she expects. Another confederate arrives at her cell, with a suicide pill and instructions to end her life. La Carozza sees the error of her ways too late, but rather than turn in the man she loves, she takes the pill and buys him more time. Mabuse turns his appetites (both sexual and monetary) on the Countess and Count Told. The Countess (Gertrude Welker) is a jaded sophisticate, one who has seen it all and done it all and is bored with life. Von Wenk tries first to get her assistance in breaking down La Carozza, but she is so shaken by the fierceness of the woman’s love for Mabuse, she cannot go through with it. After La Carozza’s death, Mabuse kidnaps the Countess to make her his latest sexual conquest, either by privation, starvation or hypnotism – it’s all the same to him. He has other plans for the Count (Alfred Abel): at a upper crust party, he hypnotizes the Count from across the room and has him cheat at cards, in full view of the other players. The Count’s reputation is destroyed and he comes to the famous psychoanalyst Dr. Mabuse for help. Mabuse agrees to take his case and sends him on a series of spiraling post-hypnotic suggestions, culminating in the Count’s throat-cutting suicide with a straight razor. Von Wenk closes in on Mabuse, still not sure of his enemy’s identity, prompting the megalomaniac to attempt his greatest triumph. Disguised as mentalist Sandor Weltmann, Mabuse succeeds in hypnotizing von Wenk on stage and orders him to leave the theatre and destroy himself by driving over a cliff. Von Wenk’s deputies follow and save him before the fatal plunge, whereupon he finally figures out the identity of the mastermind. Surrounding his house, a shootout occurs between Mabuse and his gang and von Wenk, his deputies and the Army! Wounded, Mabuse escapes through the sewers to the counterfeiting house, only to be irreversibly locked in with the blind. As they shamble toward him, Mabuse’s mind finally cracks and he sees not the blind, but his dead victims approaching him, seeking revenge. Upon tracking him down at last, von Wenk and his men find a hopelessly mad Mabuse, who is led off to an asylum. Seen today, the film is a quaint reminder of other pulp thrillers and cliffhanger serials that populated the movie theaters of the 1920s – ’50s. What one needs to remember while watching it, however, is the many innovations cinematographer Carl Hoffmann brought to the screen, breathing movable life to many scenes which had been static before. The casting is impressive, as well, with Rudolph Klein-Rogge’s Mabuse a dry run for his most famous role in another Lang production, the mad scientist Rotwang in Metropolis (1927). Ironically, his enemy in that film is the iron-willed Master of Metropolis, Joh Fredersen, played by Alfred Abel, who plays the weak-willed Count Told here. Kino Video has released a magnificent two-disc DVD print of this title, with a masterful music score by Robert Israel and David Kalat performing commentary track duties. If you’re a fan of silent cinema or just want to see where cinema’s madmen got their start, this is a good jumping-off point. I’ll be back later as I continue my Mabuse-thon with the direct sequel, Lang’s 1933 film, The Testament of Dr. Mabuse.